Spooner's most educational map game. The Travellers, or, a Tour Through Europe. An 1842 first edition example of William Spooner's graphically impressive pictorial map game board of illustrating Europe. 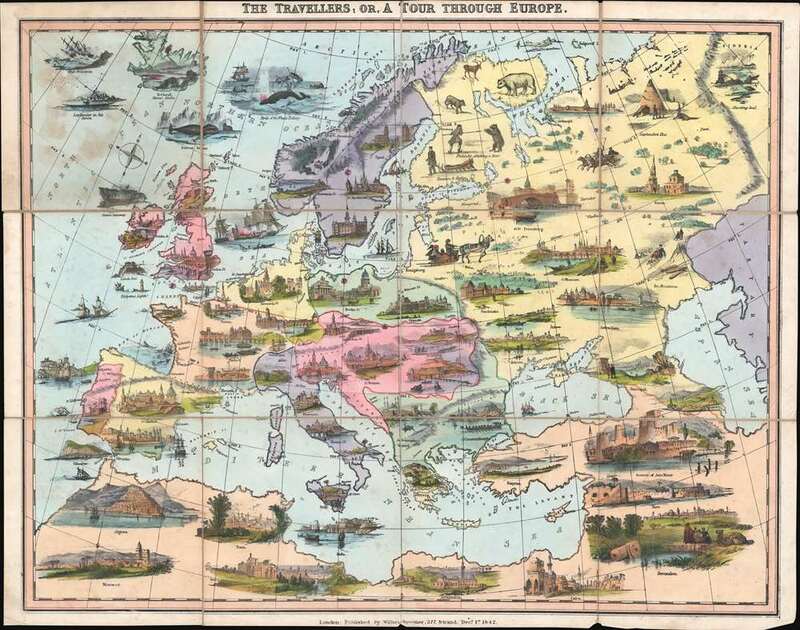 Published by William Spooner, this charming game called 'The Travelers' or, A Tour Through Europe' covers all of Europe as well as the Mediterranean Basin, African littoral, and Near East as far as the Caspian Sea. The map is highly decorative and graphically rich with cities, important buildings, sea battles, and shipwrecks illustrated in vignette form. Five players take the parts of The Travellers, who are from different nations, Austria, Sweden, Russia, Prussia and England. They must make their way to their respective capital cities each starting from a different city in Africa, or on the shore of the Mediterranean Sea. This game is played with a teetotum or spinner with four sides marked N., S., E., W. representing the directions they must move in.
. Unfortunately, there are no instructions, tokens, or teetotums accompanying this map. This is one of Spooner's more sophisticated and effective educational games and proved popular with youth and armchair travelers alike. The map appeared in at least five editions starting with this, the first edition, in 1842. Subsequent editions followed until about 1852. Very good. Folds into origal binder. Dissected and mounted on original linen. OCLC 52571403, 847609399, 557345710, 316380893. Baynton-Williams, A., The Curious Map Book, pp 137-38.